There’s no time to lose at the moment, so my apologies as I’ll have to keep this one brief! 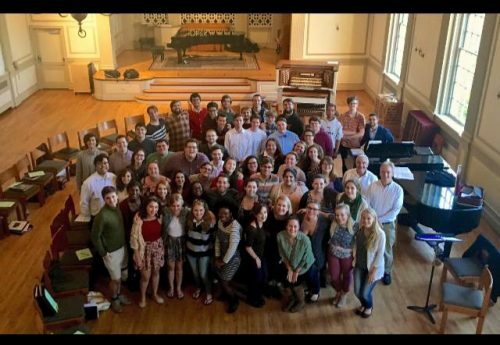 I had a fabulous few days at Westminster Choir College in New Jersey working with their numerous choirs and directors on a huge range of repertoire. The best was saved ’til last when I had the privilege of hearing the Westminster Choir themselves under the inspirational direction of Joe Miller. I was thrilled and delighted by the extraordinary high standards of music making going on there and the boundless energy and enthusiasm from professors and students in all that they do. I really hope I’ll be back there soon to see and hear how they’re all getting on. I then dashed home to spend two days producing a recording for The King’s Singers. For those who don’t really know what this involves: in a nutshell, you sit in a small room enjoying hearing the artists work their magic whilst listening out for the odd vocal glitch, passing aeroplane or lost dog wandering around just outside the venue. We also had a team of scaffolders trying their best to get in on the act but they relented after a while and allowed the KS boys some peace and quiet to focus on making heavenly sounds on a disc that’s sure to keep every KS fan happy for many years to come. These guys have taken the group to new and dizzy heights in terms of their sound and performance and I spend most of my time wondering just how do they do it! Lovely to hear the new top alto, Patrick Dunachie, sail over the guys with effortless top notes too. Back to Tenebrae, I’m really looking forward to working on our new commission Footsteps by young composer Owain Park. His composition will partner our largest commissioned work, Path of Miracles, by Joby Talbot and it will give other choirs the chance to perform alongside Tenebrae which is something I’m very excited about. We’re recording the new work on the 4th November so make sure to look out for its release next year! Now off to Salt Lake City for an eagerly anticipated week working with the orchestra and choirs of Brigham Young University. We’ll also enjoy the experience of performing live on ‘Music and the Spoken Word‘, a live TV broadcast that goes out from the Mormon Tabernacle every Sunday morning. I vaguely recall appearing on this when I was a member of The King’s Singers and being racked with fear given how many millions of people watch the programme and worrying that my voice wouldn’t work as it was so early in the morning. I won’t mention any of that to the Tenebrae singers of course…Oops!